Are design and architecture forms of art? Some people think so. Others might not make the comparison, but it’s hard to deny that even in the most utilitarian of senses when examined through an aesthetic lens that these disciplines do not have some sort of artistic component to them. Hegel, a philosopher in the mid 19th century famously described the study of “aesthetics” as the “philosophy of art” purporting that “architecture, sculpture, painting, music, and literature” exist within its areas of interest. Philosophically then, architecture and by extension design belong to the study of art and thus are forms of art. But what differentiates art from design and architecture? One could argue that those who do not believe that architecture and design can be defined as art might think that their form follows their function, a principle which became widely associated with the 20th-century modernist architectural movement. Thus for some, the aesthetic components of architecture and design are secondary to their practicality. Art then could be seen conversely as having its function follow its form, or in the case of the Aesthetes, as having its value divorced from any didactic, moral, or utilitarian function at all. If one were to consider that the definition of art born out of aestheticism was to be true then the dichotomy between art and architecture/design might make sense. Art has no practical function and thus anything that has a utilitarian aspect to it cannot be considered art. Yet an increasing majority of contemporary art exists as more than simply art for arts sake. So then, when and how do architecture and design become intrinsically valued for their aesthetic purposes and can they be considered art despite their practical functions? For some, this boundary between disciplines is not a futile disciplinary grey area, but rather a productive space of exploration. For New York-based collaborative design practice Snarkitecture, it has become a space which has proven quite fruitful. Snarkitecture describes itself as existing in a “search for the unknown”, creating work that includes large-scale projects, installations and objects with a focus on the reinterpretation of everyday materials, structures and programs to “new and imaginative effect.” Founded by Daniel Arsham and Alex Mustonen, the studio combines the two practices of art and architecture with a conceptual approach centered on the importance of experience and engagement with one’s surroundings. 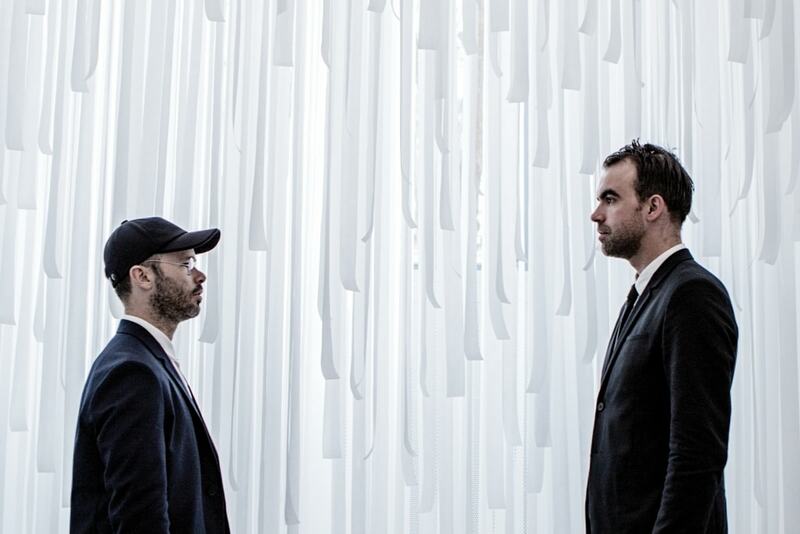 In a sense, Snarkitecture’s marriage of art and architecture is symbiotic. Their work takes an architectural approach to art in that their projects are often distinctly experiential and spatial, and yet they also take an artistic approach to architecture in that much of the forms they create serve little functional or practical purpose rather existing in a purely conceptual and aesthetic realm devoid of disciplinary limitations. Take their 2011 installation “Dig” for example. Exploring the architecture of excavation Mustonen and Arsham filled a gallery space at Storefront for Art and Architecture with a solid volume of EPS architectural foam, engulfing the existing interior in a flood of white. 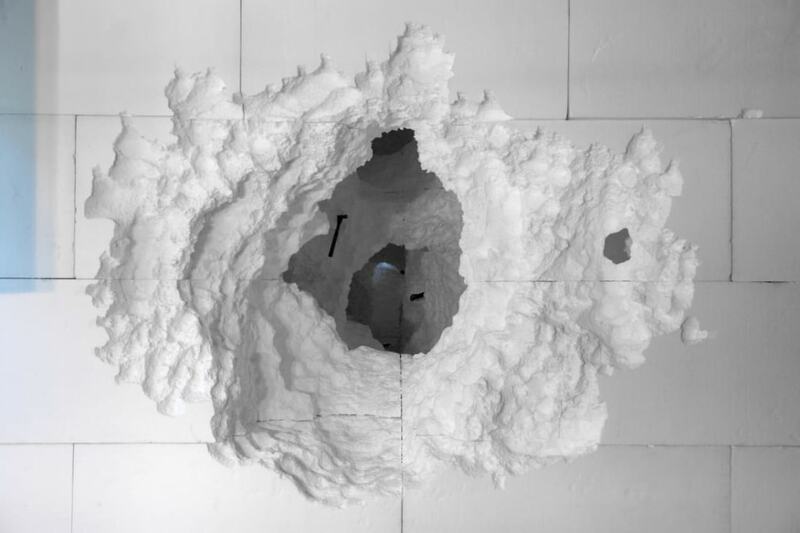 Daniel Arsham created and inhabited Dig by carving spaces from solid infill using simple tools – hammers, picks, and chisels. A cavernous entrance opened into the solid form, inviting viewers to witness the physical excavation and transformation of the industrial stock material. The project explored the intersection of primitivism and contemporary architecture. The complexity of the final surfaces and form suggesting a digital origin, rather than one achieved entirely by hand. By inverting the traditional spatiality of architecture by filling the blank space within a structure, Dig was a manifestation of Snarkitecture’s ethos. Inversion of expectation, process vs. product, and a blurring of the lines between disciplines giving way to an uncanny experience of space. The end result of the process, a porous cavern not unlike an inverted sculpture could well be considered contemporary art, and conceptually the piece speaks to the dadaist tendency towards chance and error. Drift, another of their installations follows a similar concept. 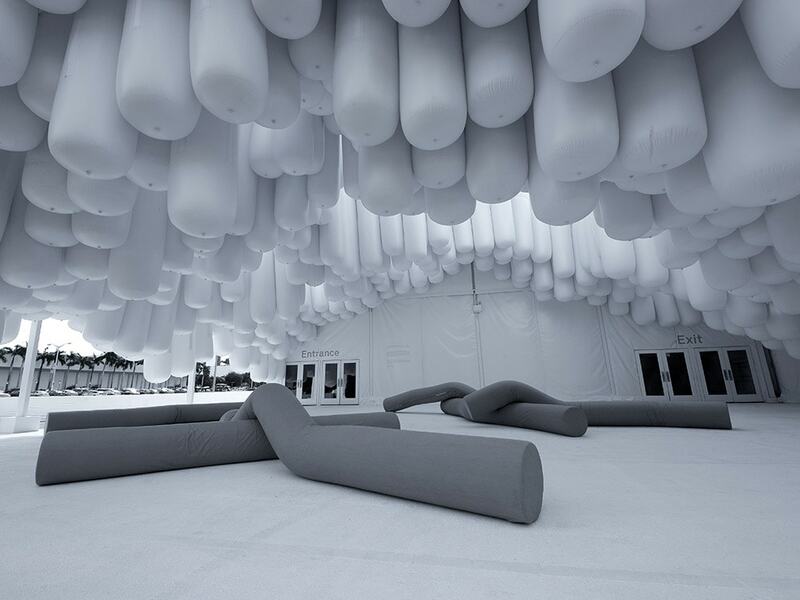 An entrance pavilion for Design Miami/ 2012, the project plays with the familiar concept of a vinyl event tent by reformulating the material to create a floating environment. Inflated tubes bundled together form a topographical landscape in suspension: an ascending mountain above and an excavated cavern below. 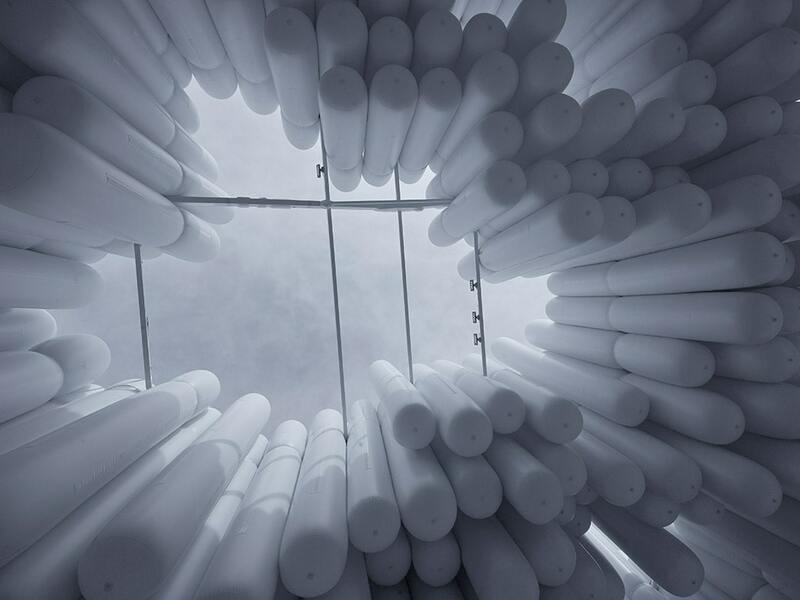 Arranged vertically, these long cylinders infill the area of the entrance courtyard, and are then lifted to produce areas of circulation and rest for the visitors entering and exiting the Design Miami/ fair. The installation sees Mustonen and Arsham inverting the expectations of the use of space, material, and orientation through the use of these vinyl tubes. By utilizing blank space to create volume the inverted topography sees the traditional experience of landscape upended resulting in a new awareness of orientation. The result is neither traditionally architectural nor can it simply be described as a piece of art in a traditional sense. Serving as a sort of structural installation, both architectural and artistic, Drift walks a fine line between the two disciplines serving to be neither and both at the same time. Clearly, the genius of Snarkitecture lies in their liminality. Even their design projects continue to investigate the productive tendencies of hybridization. Their conceptual collaboration with quartz manufacturer Caesarstone at the Interior Design Show in Toronto saw the design practice exploring the kitchen island as a space of interactivity and altering states. 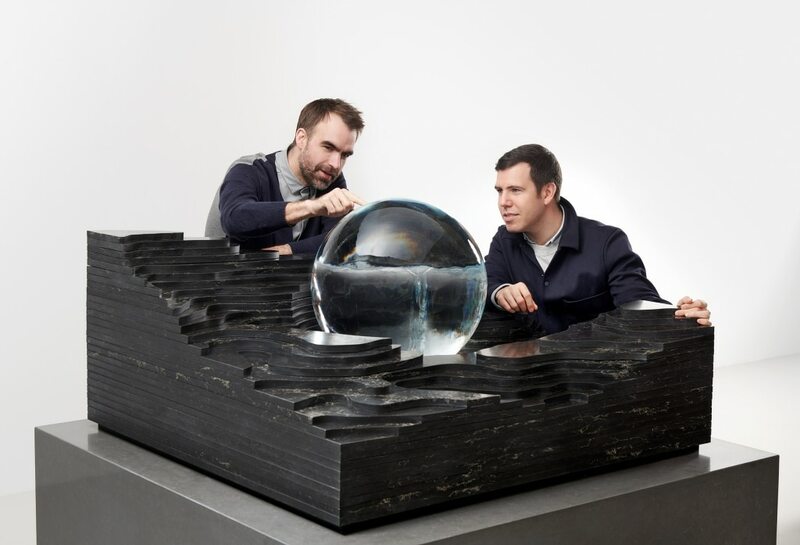 Creating conceptual topographical displays of quartz each relating to a different state of water, the project explored the kitchen as space, not unlike that found in nature. One such island resembled a geyser utilizing a rising plume of steam as its centre. Another found a giant ball of ice in its reservoir bearing the likeness of a fabricated glacier. As an exercise in branding the project serves to showcase the versatility and durability of the material, not to mention its beauty. The project serves to showcase the kitchen as a place of dynamic activity and the home as a microcosm of the world itself in addition to demonstrating the many functions of quartz. Neither practical in nature nor simply “l’art pour l’art”, Snarkitecture’s latest design project is a testament to their steadfast dedication as examiners of liminality, and an example for brands as to how innovation carves out new and lucrative spaces both figuratively and literally.